Water pH level is a measure of how acidic the water is. Water is considered acidic if it has a pH level below seven, and it is considered alkaline if it has a pH level above seven. If the water has a pH level of exactly seven, it is considered neutral. 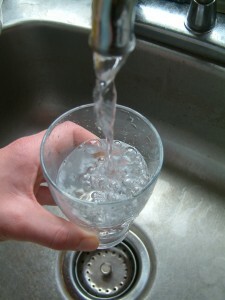 A safe pH level range for drinking water is considered to be between six and 8.5. You may notice some issues with your water if it falls outside the acceptable pH range. For example, water with a high pH level may feel slippery, have a taste similar to baking soda, and leave deposits on your sinks and fixtures. Alkaline water can be caused by mineral deposits such as limestone in groundwater, or contamination of drinking water from wastewater that contains cleaning agents. Water with a low pH level may have a metallic taste, and cause corrosion on your sink and fixtures. Acidic water can be found in areas that are affected by acid rain, and is sometimes found in glacier water due to dissolved carbon dioxide. The EPA also warns that drinking highly acidic or alkaline water can be harmful to one’s health. If you suspect that the pH level of your home’s water falls outside the acceptable range, the next step is to have the water tested. To be sure that a professional is testing the pH level of your home’s water, turn to RainSoft. Our expert technicians can test your water for numerous issues, including pH level, water hardness, the presence of contaminants, and more. Depending on the findings, the technician can then recommend the best course of treatment for solving your water problems. To have the pH level of your water tested, contact RainSoft today.